Mark Twain once said, "It is the prohibition that makes anything precious." The United States learned that lesson the hard way not long after January 17, 1920, when it made the nation’s fifth-largest industry largely illegal, a move near-universally panned ever since. Smuggling alcohol during Prohibition became its own industry, and naturally, gang violence meant to lubricate that smuggling increased, as well. This fake book "flask" with the clever title Spring Poems: The Four Swallows is actually, as the name implies, four flasks in one. Using all four vials, a sneaky drinker could get girl-drink drunk on a pretty complicated cocktail. The photograph above is of a display at the Museum of the American Cocktail in New Orleans, but a Getty Images photograph from Ullstein Bild showing a woman "modeling" the book confirms its vintage. The caption reads "A woman using a dummy book, bearing the title 'The Four Swallows,' as a hiding place for liquor during Prohibition, 1920s." A shocking 75% of all the alcohol smuggled into the US during Prohibition crossed the border at the so-called "Windsor-Detroit Funnel," the nickname for waterways between Michigan and Ontario. By 1929, the second largest industry in Detroit, believe it or not, was "rumrunning," which netted $215 million per year. Jennie MacGregor was arrested by federal agents in Minneapolis on April 10, 1924 for this audacious get-up that dispensed "wet goods." It was known, according to a note on the back of the original photograph, as a "bootlegger's life preserver." The New York Times purchased the photo 10 days later and published it in their weekly Mid-Week Pictorial under the caption "A Perfect 36." 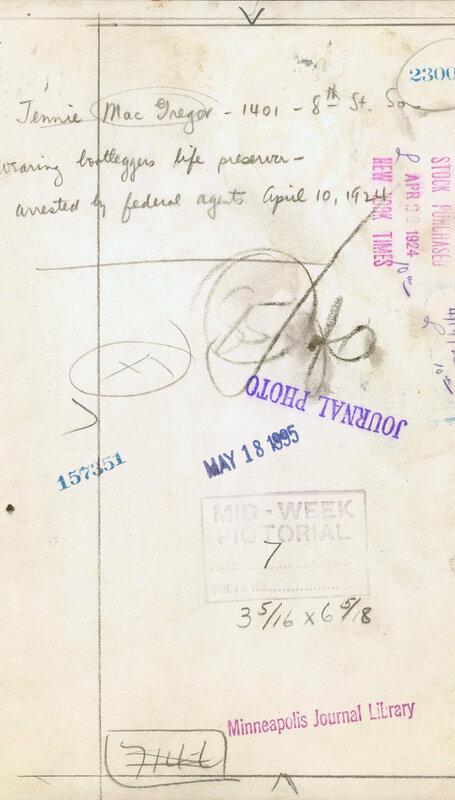 J. Anne Funderburg's Bootleggers and Beer Barons of the Prohibition Era tells the story of one "unhurried smuggler" caught by US Customs agents after he dropped a basket of eggs. The agents later learned the smuggler carefully poked tiny holes in all of the eggs, drained them, and then sealed them back up, full of surely eggy-tasting booze. A "frazzled Ukrainian housewife" tried the same trick, but a savvy agent thwarted her by simply breaking it in his hand, sending the liquor oozing to the ground.